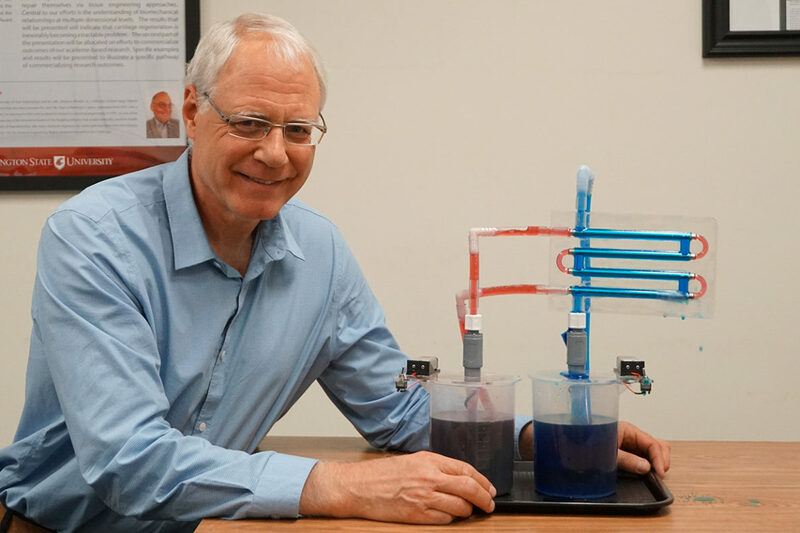 Bernie Van Wie shows hands-on learning module developed to help students observe flow patterns of the water that can help them understand heat flow and calculate liquid speeds. Washington State University researchers will train faculty and distribute unique hands-on experiment kits to universities across the U.S. as part of an effort to help students better understand engineering concepts. The five-year effort is funded by a recently announced $2.4 million National Science Foundation grant. Led by Professor Bernard Van Wie, the interdisciplinary WSU research team, consisting of Olusola Adesope, Prashanta Dutta and David Thiessen, will examine how well students learn with the hands-on learning modules and how they perform compared to students sitting in traditional lectures. The modules can help clear up misconceptions students might have by helping students actively engage their senses while learning. “We want this project to help students learn and retain concepts in visual, experiential ways,” said Van Wie, who is part of WSU’s Gene and Linda Voiland School of Chemical Engineering and Bioengineering. This also will help improve student retention rates, especially among those who struggle in introductory courses, he said. “Learning key science concepts through a hands-on approach will promote engineering student interest, motivation and learning,” said Adesope, an associate professor of educational psychology at WSU who is leading the experimental design and assessments on the project. Instructors can use the learning modules to demonstrate engineering concepts in fluid flow and heat transfer. For instance, one of the modules is a maze-like clear plastic heat exchanger with red and blue water. This device allows students to observe flow patterns of the water that can help them understand heat flow and calculate liquid speeds that affect heat flow from hotter to colder liquids. “Learning on a device like this, students use their senses of sight and touch to grasp otherwise difficult to understand phenomena,” Van Wie said. Van Wie came up with the idea for this project in the early 1990s when he taught a course in fluid mechanics and heat transfer. He realized that assigning hands-on projects was a better way to teach and for students to learn. Through a series of previous NSF grants, the project team has created and improved the devices, and the researchers are now ready to deploy them across the nation. The hands-on devices can be directly used in the classroom, unlike some other devices on the market which need a functioning laboratory and cost a lot of money. Instead of lecturing, instructors can center a whole class around the learning modules. distribute the modules to a total of 46 institutional programs, including historically black colleges and Hispanic-serving institutions, as well as public, private, 4-year and 2-year schools to either support or correct their initial thoughts about how things work. Some students will become experts in using the devices and help others out. “We also want to learn how members in an academic community help each other adopt what we are doing,” said Van Wie. Because the modules enable a visual way of learning, students can take the mathematical equations they’re taught in class or from texts and see them in action. “The learning modules present visually compelling evidence that can directly challenge students’ misconceptions and foster conceptual change,” said Adesope. 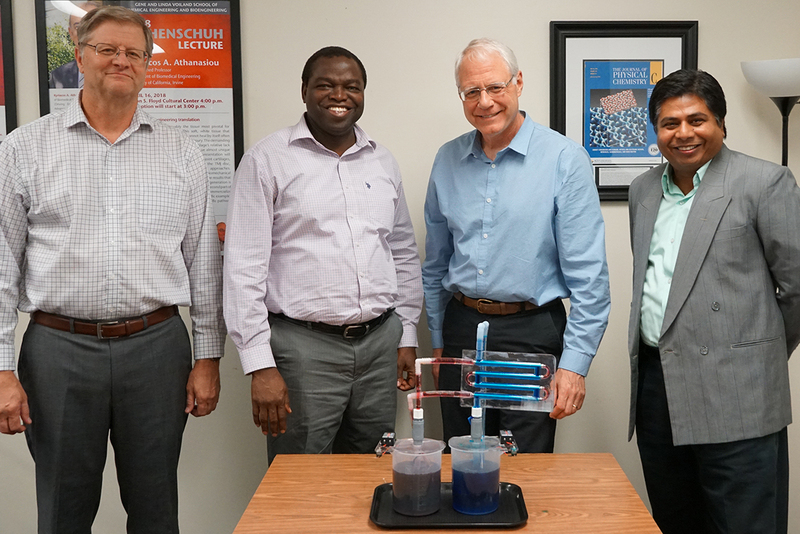 Lead researchers on the project include David Thiessen, Olusola Adesope, Bernie Van Wie and Prashanta Dutta (l-r). The researchers have identified seven hubs across the U.S. that will distribute the modules to a total of 46 institutional programs, including historically black colleges and Hispanic-serving institutions, as well as public, private, 4-year and 2-year schools. Dutta, a professor in the School of Mechanical and Materials Engineering, helped develop the nationwide network for the project. Along with the team, he is designing a strategy to get knowledge to the partner institutions, including organizing a day-long workshop for hub coordinators. The coordinators will arrange a similar workshop to train instructors in their regions, who will then implement the strategy in their classes. The team is currently looking to sign on a company to manufacture the devices before they start conducting workshops. They hope to expand the modules to be able to demonstrate concepts involved in more types of industry equipment. The researchers are also working to reduce the device cost from $125 per unit to about $50, which for a full set of four different units will equal the cost of an average textbook. In addition to professors from WSU, the research team also includes Jacqueline Gartner, a WSU alumna and assistant professor in the School of Engineering at Campbell University in Buies Creek, North Carolina. Gartner has a separate NSF budget of $225,000 as part of this collaborative project.